On earlier pages I showed how to set up a Google Compute Engine virtual machine, run FreeBSD, and set up a basic Apache/PHP web server. Now let's set up HTTPS! 1: Set up both RSA and ECC key pairs. 2: Obtain Let's Encrypt certificates for both. 3: Set up automatic renewal. On the final page I will tune the Apache HTTP headers. TLS, the successor to SSL, authenticates a web server and provides confidentiality and integrity of the data. In July 2018, Google's Chrome browser began marking HTTP pages as Not Secure. Google had warned the previous year that Chrome would eventually do this. Once Chrome does something, the other browsers quickly follow. Google also announced back in 2014 that HTTPS already had a slight effect on a page's rank in search results, and the weight would probably increase. In other words, if you don't run HTTPS, you will be ranked lower in search results. Similarly, once Google's search algorithm starts doing something, the other search engines follow. So, even if a web site is purely informational, you still want to set up TLS. Asymmetric cryptography, also called public-key cryptography, bases its security on a trapdoor function. That's a function that is easy to compute in one direction but enormously difficult to compute in the opposite direction. RSA, which was developed in the late 1970s, relies on the difficulty of factoring the product of two very large prime numbers. It is easy to multiply integers, even ones with hundreds of digits, but it is impractically difficult to start with such a product and figure out which two large prime numbers went into it. Then people worried: what if someone develops a general-purpose quantum computer? Shor's Algorithm could quickly factor very large numbers if you have such a platform on which to run it. Around this time, people were starting to use mobile devices for Internet access, but smart phones with fast multi-core CPUs had not yet appeared. So, Elliptic Curve Cryptography or ECC suddenly became popular. Its trapdoor function is based on a discrete logarithm, entirely different from RSA's factoring. Analysis by NSA and NIST showed that ECC provides equal security with much smaller keys than RSA, requiring much less computation. So, there were two advantages for ECC: much higher performance, and expected resistance to sudden obsolescence when quantum computers appear. Certificate authorities began issuing dual certificates for sites: one based on ECC which newer clients would prefer for performance, and RSA as a fall-back. Since then, cryptographers have discovered that ECC will be just as susceptible as RSA to attack by quantum computers. But ECC still has a performance advantage. Let's Encrypt is a certificate authority founded by the Electronic Frontier Foundation, the Mozilla Foundation, the University of Michigan, Akamai Technologies, and Cisco Corporation. The Let's Encrypt CA gives you a certificate that's good for 90 days. The short certificate lifetime makes automated renewal important. ACME, the Automated Certificate Management Environment, is a protocol for interacting with the Let's Encrypt CA. You use the certbot program to carry out the various steps. Install the py27-certbot package to get it. I told it where the web document root was located, and then listed the domain names. Yes, clients will be redirected from www.cromwell-intl.com to cromwell-intl.com as needed, but they must first make a secure connection to the server and ask for the longer name with "www.". There is some narrative output, and you are asked for an email address in case they need to send you an urgent renewal or security notice. You agree to the terms of service, then answer whether it's OK to share your email address with the EFF, and then it's done! The key pair, certificate, and associated files have been created and saved under /usr/local/etc/letsencrypt. Let's see what files are there. Before generating the CSR or Certificate Signing Request, I must slightly change the OpenSSL configuration to enable multiple names, both cromwell-intl.com and www.cromwell-intl.com. Now ask Let's Encrypt to generate a certificate. This time we pass it our new CSR. It took some research after initial frustration to learn that certbot is very fussy about file names when it comes to renewal. You have archive/example.com with the actual files, and live/example.com with symbolic links pointing to them. You can rename the archive and live directories, but the files must have specific names. The "archive" directory, or whatever you end up naming it, must have files named precisely cert1.pem, chain1.pem, fullchain1.pem, and privkey1.pem. The "live" directory, again possibly renamed, must have symbolic links with those names minus the "1", precisely cert.pem, chain.pem, fullchain.pem, and privkey.pem. Rename the existing "archive" and "live" directories rsa-archive and rsa-live. Recreate the symbolic links in rsa-live/cromwell-intl.com to point to the relocated "archive" files. Edit renewal/cromwell-intl.com.conf and make corresponding changes to the paths. Move the ECC files into the ecc-archive area, changing the names as required. Create the symbolic links under ecc-live. Rename the RSA files in csr and keys, and move the corresponding ECC files into those areas. Copy the file in renewal to ecc-cromwell-intl.com.conf and edit that new file so it refers to the ECC files. Now test this with certbot renew --dry-run. We can use the openssl tool to parse and display the certificates. The problem is that the certbot program cannot renew a certificate for an ECC public key. It really doesn't renew anything, its "renewal" process generates a new RSA key pair and obtains a certificate with the new public key. The --csr option to specify a certificate signing request works only with the certonly subcommand, as described on the certbot manual page. If you create a configuration file in the renewal directory for your ECC key pair, it will simply create an additional RSA key pair and create a certificate for the public key. It places the results in files that you expect to hold ECC keys and certificate. You can only request 5 duplicate certificates per week. So, develop any scripts with the certificate renewals commented out, until you're pretty sure that it's going to work. 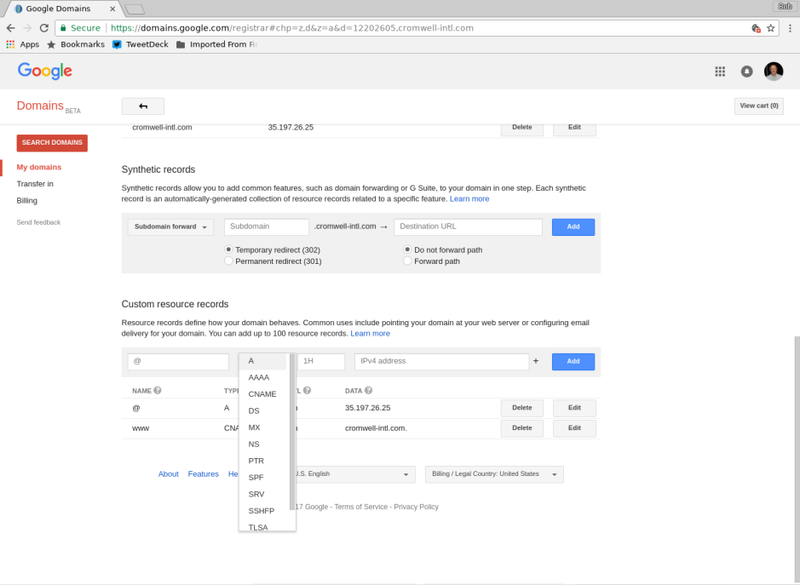 See the rate limit documentation for details. ## 4096-bit RSA key pair and creates a certificate from the public key. ## public key, and request a new certificate. ## The above creates three files in the local directory. ## Move them into place. ## Restart the web server so it's now using the new files. Now set up a crontab job to run your script once a week. Using the webroot path /usr/local/www/htdocs for all unmatched domains. Edit the httpd.conf configuration file and add the following to the end of the file, changing the hostname and file system paths as needed. Make sure to use the file fullchain.pem, which contains the full certificate chain, and not cert.pem which has just your site's certificate. # if you are hosting several sites on one server. Restart Apache and verify that you can connect with both HTTP and HTTPS. You could run a Qualys server test, but at this point it would probably get a "B" grade at best. We will tune the configuration, but first let's set up redirection. Redirect to HTTPS and Remove "www." Add the following to your .htaccess file in the root of the web site. Bold shows additions here. Don't duplicate the RewriteEngine line. # already exists earlier in the file. # We added the following in an earlier step. # it isn't passed to the PHP engine causing a "Primary script unknown"
# log entry and a plain "File not found" page. Yes, I did the redirection with the site-specific .htaccess file. I could have instead done it with slightly different syntax in the server-wide httpd.conf configuration file. For the single site, given its size and traffic, I didn't see a big advantage of one method over the other. Now test all combinations of the redirections: http vs https, www. vs not, and include requests for nonexistent files and directories. Apache has a good SSL/TLS how-to document. Even more useful, Mozilla has a configuration generator. You select your server, its version, and your OpenSSL versions, and then you select the security profile. Let's say you're setting up a server for use within your organization, and you have full control of the desktop systems and any portable laptops that could be used to connect in from outside. I recommend the strictest "Modern" profile for that case. All your client machines will need to be fairly current, but that should already be the case. However, let's say that you want to be open to most all clients from the public. That's my situation. I have ads on my site. While it would be nice if everyone used up-to-date operating systems and browsers, I don't want to block or even inconvenience people with outdated platforms. I used the "Intermediate" profile as a starting point. Here is what I added toward the end of the httpd.conf configuration file, before and outside the VirtualHost stanza, so it will apply to all virtually hosted web sites I eventually set up on this server. The cipher suite is usually one enormously long line with no whitespace. That's hard to read and much harder to modify, so I prefer to split it across multiple lines. Just make sure each backslash is the last character on its line. # generator gave me, putting better ciphers first. # Enable session resumption (caching). # default, no need to specify that, but here's the syntax. The server supports 3DES as a fallback position if none of the stronger ciphers are supported. That allows connections from IE 8 on XP. While 3DES is flagged in the report as weak, at least at the time that I did this it did not lower the score. Unlike RC4, which capped the grade at B at the time. DNS CAA or Certification Authority Authorization provides a way to indicate in a DNS record just who is allowed to be a CA for the site. See this Qualys blog for details on what CAA is, and how the CA/Browser Forum has mandated its use. Google Domains did not yet support CAA records when I started this project in July 2017, as you can see below. 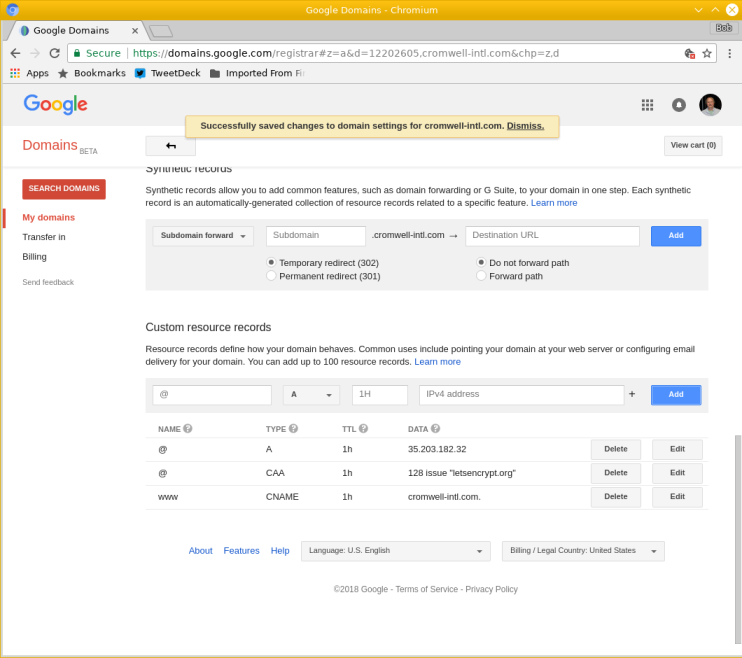 Google Cloud DNS, a different product, did. cromwell-intl.com. 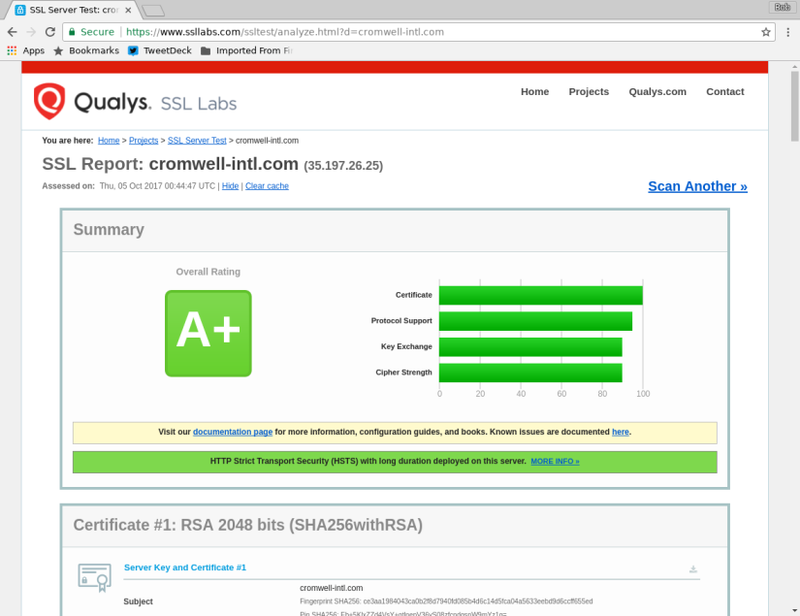 3570	IN	CAA	128 issue "letsencrypt.org"
cromwell-intl.com. 78163	IN	NS	ns-cloud-c1.googledomains.com. cromwell-intl.com. 78163	IN	NS	ns-cloud-c4.googledomains.com. cromwell-intl.com. 78163	IN	NS	ns-cloud-c3.googledomains.com. cromwell-intl.com. 78163	IN	NS	ns-cloud-c2.googledomains.com. I was very happy with this result! There are just a few more things to do. Proceed to the final step to see how to tune the HTTP(S) headers.